Jas doesn't like to sit down with things in his pockets (is this a guy thing?) and it's not exactly trendy for guys to carry purses or man-bags with them where ever they go so somehow his 150 lb wallet (seriously, that guy collects all sorts of cards—paper, plastic, he's not picky) always ended up in my 317 lb purse. So for Valentines my suuuuuuuper romantic self bought him this new, totally rad wallet that can only hold so much (two pockets on each side and a thin middle slot for cash or whatev). Genius! Plus his other wallet was on its last stitch—literally. 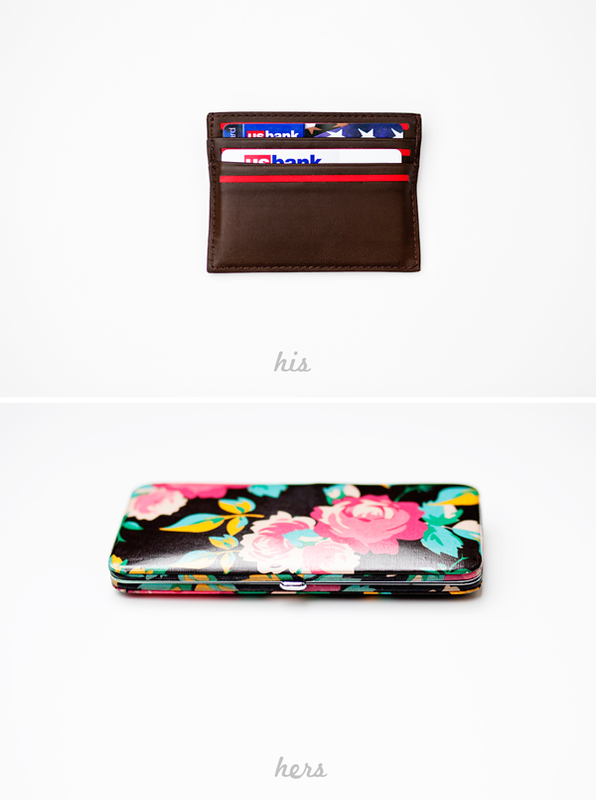 And here is my little clutch wallet in all of her floral-glory. Good old Target, "where you can expect more and pay less" (catchy, no?). Maybe I should try to develop his dislike for sitting with things in pockets. That is how I broke my cellphone, but that was 2 phones ago.........or has it been an unknown epidemic? Ooo. Intrigue. p.s. It's my mama's birthday!!!! That's right, March 25. I think it's a cute day for a birthday, but September 4 might be cuter. Anyways.........Happy Birthday Mom! We think you're tops. Jared hated the permanent imprint that would form on his pants from his wallet, so we had to do the same thing. And the small wallet is genius! Love yours, too! So cute! landon needs a new wallet. BAD. and my little sister has the same wallet as you. My hubby has an almost identical wallet! He loves how tiny it is and how well it fits in his pockets! It's definitely a guy thing to not like sitting on things. Love your wallet! My wallet I have now is nice, it's my sister's old one. I love that it still looks good, and it's used. Yes, I'm admitting that I'm cheap.